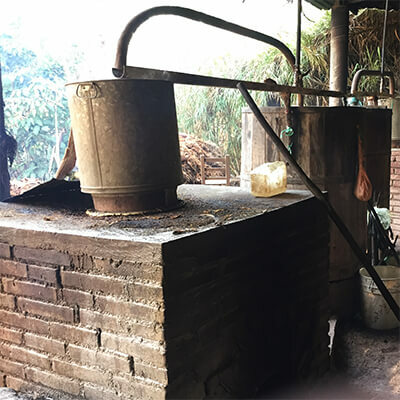 Refrescador distilling is a technique that is common to the area surrounding Miahuatlan, Oaxaca, and it has also been adopted by some producers from other regions as well. The still looks similar to a copper alembique still except there is a stainless steel cylinder surrounding it. The cylinder is filled with water, allowing it to cool the upper part of the still, which works as a condenser that sends the alcohol vapor back down into the boiler before being heated again and leaving the still into the condensing coil. This method of distilling essentially allows for two distillations during a single pass through the still.